Founded by director Alvaro Bussab in 1994, Caboverde is a full-service supplier to the scientific and scholarly publishing community in Brazil, and since 1998 it has delivered more than 180,000 articles to SciELO (Scientific Electronic Library Online). Located in São Paulo, Caboverde began using Edifix in 2014. Caboverde’s mission is to minimize the gap between links in the information chain. Their services include digital imaging, file conversion, design, consulting, composition, and development. Caboverde’s association with SciELO goes back almost to SciELO’s inception as “a publicly funded initiative set up to promote cooperative, free electronic publishing of scientific journals from developing countries; the development of regional databases; and the implementation of indicators of scientific literature usage.”1 Founded in 1997, SciELO now indexes and archives over 1200 journals and hundreds of thousands of scientific papers from Brazil, Spain, South Africa, and a dozen Spanish-speaking countries in North, Central, and South America and the Caribbean. SciELO’s archive includes more than 13 million citations. For participating journals, SciELO’s bibliometric indicators are a key benefit. To facilitate calculation of these metrics, SciELO has strict requirements for submission of metadata and full-text XML, including tagging and linking of citations. In addition, SciELO’s mandate to serve developing countries makes citation accuracy and citation linking particularly crucial, as inaccurate citations and linking failures may preclude access to the cited resources for researchers in these countries. 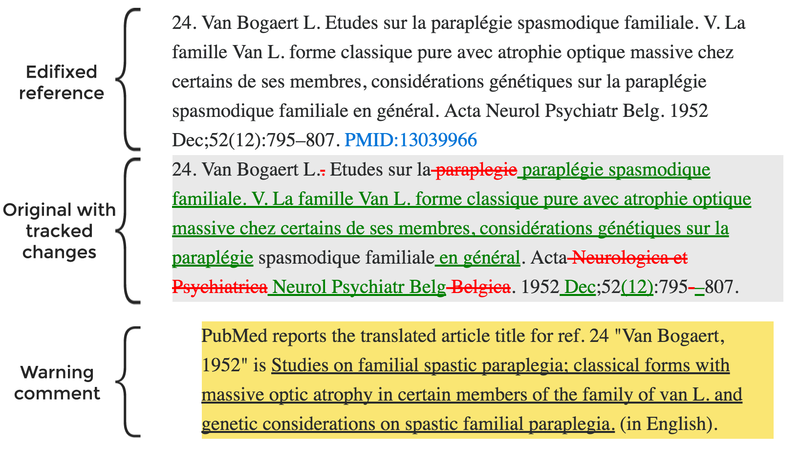 As researchers have documented,2,3 inaccurate referencing has been an issue for decades. According to estimates, the proportion of published references that contain errors is at least 5% and can be as high as 50%,2 depending on the source and the discipline. Citation accuracy is arguably more problematic in an online publishing environment than when print was the version of record. One key service offering for Caboverde’s clients, therefore, is their bibliographic and editorial standardization—including verifying and correcting approximately 18,000 reference entries for about 700 articles published in approximately 35 journal issues per year. This function is crucial to publishers and publications in Brazil who need to meet SciELO’s stringent metadata requirements for accurate metrics, and is one way Caboverde fulfills their goal of minimizing gaps in the information chain: accuracy of references is a key element of the scholarly communication ecosystem. Manual verification and correction of bibliographic references, however, is extremely time consuming. Using an entirely manual process limited Caboverde’s capacity to perform these crucial functions and to grow their client base. Caboverde became an early adopter of Edifix, Inera’s web-based automatic reference processing tool, which was first introduced in 2014. Using heuristic analysis and patented algorithms, Edifix can parse all manner of references, including incomplete and incorrectly formatted entries, and reformat references to any of a wide range of specific editorial styles. Edifix also searches the PubMed and Crossref databases to find discrepancies, correct erroneous content, add missing information, and supply PMID and DOI links. Once this is done, Edifix can export reference lists in several formats, including Microsoft Word and JATS XML. Replacing the multi-step process of manual reference verification and linking with Edifix’s automated one-step process has allowed Caboverde to drastically reduce processing time for key reference types: journal articles, books, and book chapters, particularly in STEM disciplines. Rather than editing each reference by hand, manually searching for PMID links, and then manually searching for DOI links, Caboverde’s reference processing staff can now submit large batches of references and let Edifix do all three of these steps. As a result of integrating Edifix into their bibliographic standardization service, Caboverde has seen a >50% reduction in reference processing time and has been able to expand the service to more clients without additional staff. Manual copyediting, citation checking, and linking can now be reserved for those citations that require a human eye, while Edifix handles the routine work quickly and efficiently. Since first adopting Edifix in mid-2014, Caboverde has processed over 23,000 references using 5 different editorial styles, at an average processing time of <3 seconds per reference. Edifix linked more than 21,000 of these references to metadata on Crossref, PubMed, or both. Edifix Your References—The First 100 Are Free! Inera strongly believes in the importance of accuracy and discoverability in citations, and we are proud to be part of Caboverde’s tool set! Ensuring reference accuracy with limited human resources is a challenge for journals, publishers, and societies alike—a challenge that Edifix has helped Caboverde to meet. We’d love to help your organization, too! You can Edifix your first 100 references absolutely free with an Edifix trial. Questions? Check out Edifix.com or contact us for more information. Interested in an Enterprise subscription, custom reference style, or Edifix API integration? Contact our sales team at sales@edifix.com. Follow Edifix on Twitter @edifix. See also the SciELO Bibliography.